*787 aircraft share these routes with our other aircraft and are not guaranteed. 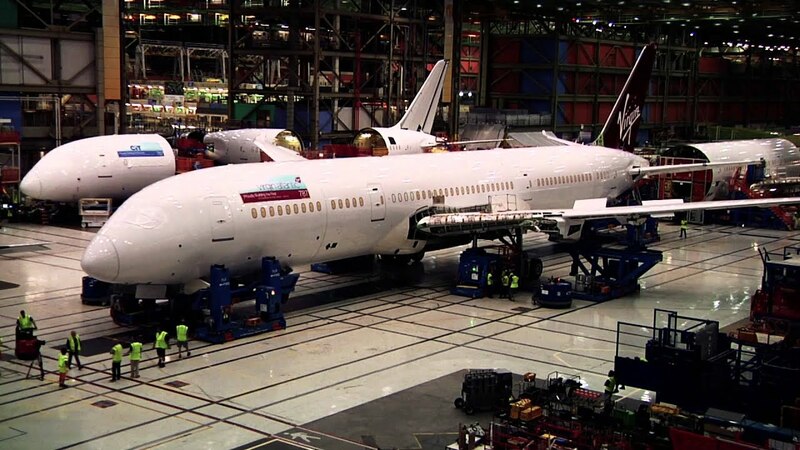 Ever wondered what it takes to build a 787? Our friends at Boeing have finished putting together 'Birthday Girl' and they filmed the process from start to finish, so you can see how it's done. The 787 Dreamliner is configured with 31 Upper Class, 35 Premium and 198 Economy seats. Upper Class passengers can enjoy a new iteration of Virgin Atlantic’s iconic ‘Upper Class Suite’ which incorporates all of the popular features of this along with some new design elements. There is a more sophisticated look using new dynamic mood lighting, especially around our new bar area. Not only is this a place to mingle and have a drink, it is also a space to eat, relax and work. There is a refreshed Premium cabin with an even more comfortable seat design and a social space where customers can stretch their legs and mingle with other passengers - the Wander Wall. Economy seats are best-in-class with the Recaro 3620 model with some nifty space saving solutions to give you more room to stretch out and enjoy your flight. Combining the unique features of the 787 and best-in-class Recaro seats, our Economy cabin is now an even more relaxing place to be. Our 787s feature a refreshed Premium cabin. With a new seat design and new seat foam, you'll have even more space to stretch out. Stretch your legs and experience the Wander Wall in Premium. It's a space to have a chat with your fellow passengers or grab a mid-flight snack to keep you going. Featuring a modified version of our original Upper Class suite, our 33'' wide flat beds are super-comfy, even for the toss-and-turners among you. Our new bar design allows you to dine in style, or prepare for that crucial business pitch with our built in presentation screen. All our 787s offer WiFi throughout, so you can chat, email and stay in touch with the world below. Follow the instructions when you enable WiFi on your device and you'll be online in no time. A charge for WiFi applies. The 787s set the benchmark for in flight service and comfort - and we've got some exciting treats coming your way. Look out at the world with a better view from every seat. The biggest windows of any commercial aircraft also have electronic lighting, dimmable at the touch of a button. Board, dine, relax, sleep and play all in perfect light. Adjusting to your destination time zone, you should arrive feeling brighter and less jet lagged. Enjoy a greater sense of space and move around more freely thanks to higher ceilings and overhead bins. Cleaner air with a lower cabin altitude means you’ll feel more comfortable and refreshed. Step onboard to a stunning new bar backdrop. It’s the perfect space to mingle, meet or simply unwind. All our 787s offer WiFi throughout, so you can chat, email and stay connected in the air. A charge for WiFi applies. We’ve fitted the best in class Economy seats. More legroom and a comfier recline, making the most of the space around them. Our Premium cabin has even more comfortable seats and a new Wander Wall area where you can have a snack or stretch your legs. A series of innovations including as much electrical architecture as possible and enhanced aircraft health monitoring. The Dreamliner is 21% more fuel efficient than other similar sized aircraft in our fleet, which means much less carbon dioxide emissions. Premium's extra space, premium service and thoughtful extras are hard to resist. Take a look at our blog, where you'll find our fun and informative infographic about our 787-9.